Bangalore: Brothers Vijay and Deepak Raheja who used to run B Raheja Builders, a real estate firm that operates in Mumbai, Bangalore and Pune, have split the business between themselves and set up separate companies, according to an executive at a company that does business with B Raheja Builders and who did not want either himself or his firm to be identified. The split was confirmed by executives working for Vijay and Deepak Raheja although the brothers themselves did not comment on it. The head of a real estate advisory claimed the split was an amicable one. “This is a planned split which is not driven by acrimony. Splits are inevitable when a company has grown big enough and two brothers decide to pursue interests separately," said Akshaya Kumar, chief executive officer of Park Lane Property Advisors. Mint couldn’t independently ascertain the contours of the split or the events leading up to it. Vijay Raheja’s new company is called V Raheja Design Construction while his younger brother Deepak Raheja’s firm is simply called Advantage Raheja. Executives at the two firms said that after the split, the various properties and projects of B Raheja Builders have been divided between the brothers. For instance, the new JW Marriott hotel under construction at UB City in Bangalore’s central business area will be handled by V Raheja Design, which also owns around 100 acres of land near the city’s new Devanahalli airport. “Vijay Raheja’s new firm has several projects in Bangalore including a villa project in Whitefield (in the city’s outskirts), a commercial complex in Richmond Circle (central business district) and another high-end residential property in Hennur. 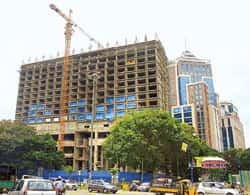 We are targeting a 2009 deadline to complete the Marriott project," said a senior executive at V Raheja Design Construction in Bangalore who did not want to be identified as he is not authorized to speak to the press. This executive added that the company is also looking for more land in the city to launch new projects. Meanwhile, Advantage Raheja is developing a residential project in Mumbai, Iris Park, and another residential property by the same name in Bangalore, said a senior marketing executive at the company who, too, did not wish to be identified because he is not authorized to speak to the media. This person added that some ongoing projects including one in Bangalore’s Dollar’s Colony area would be completed by B Raheja Builders. The 56-year-old B Raheja Builders was founded by Bhagwandas Raheja. His brother Lachmandas Raheja was also in the real estate business and founded the K Raheja group in 1956. This group has since been split between Lachmandas Raheja’s sons Gopal Raheja (K Raheja Constructions), Chandru Raheja (K Raheja Corp. and Shoppers Stop Ltd) and Suresh Raheja (K Raheja Universal). After developing hotels such as JW Marriott and premium residential properties in Mumbai, the B Raheja group expanded its operations to the IT hubs of Bangalore and Pune. Last year the company received an investment of $45 million from US-based investment banker Wachovia for two projects in Bangalore. Real estate firms typically float each of their projects as a separate company so as to raise money efficiently. B Raheja Builders is privately held and no independent valuations on its size are available. “A single company can’t have the kind of bandwidth and specialization which these individual companies have achieved. In the case of the Rahejas, the next generation has only consolidated and bettered what their predecessors achieved," said Anuj Puri, country head of Jones Lang LaSalle Meghraj, a real estate advisory. B Raheja, for instance, is known for its ability to manage hotel projects. Gopal Raheja and Vijay Raheja went to court two years ago over a hotel project in Bangalore before eventually settling their dispute. Gopal Raheja and Chandru Raheja have also had their differences which were made public in the initial share sale filing of the latter’s Shoppers Stop. The Mindspace complex in a Mumbai suburb has both Gopal Raheja (better known as GL Raheja) and Suresh Raheja holding a stake in the project being developed as a joint venture with the Nusli Wadia-promoted FE Dinshaw Trust. Even the Marriott in Juhu, Mumbai, was co-developed by various Raheja companies. Bombay Dyeing chairman Wadia and Chandru Raheja have been scrapping over the co-development of 200 acres in Mumbai’s Malad area, although the 2 July edition of The Times of India said both sides were looking to settle the issue out of court.